Our technology allows to process multiple Earth satellite images taken at different times and interpolate them into a smooth continuous animation, in real-time. Specifically, NASA provides EPIC images in the visible spectrum about 12 times a day, Blueturn transforms them into a continuously rotating Earth, “living” through its accurate and real clouds motion. Besides the computed graphics algorithmic challenge, we are also inventing the right user interface to navigate intuitively through time and space around this living Earth. We are focusing our technology efforts on aesthetics and ergonomics, in order to convey an overwhelming emotional enchantment, the kind that already brought astronauts to another level of environmental consciousness after seeing the Earth from above, the kind that will awaken the poet inside each one of us. We aim at showing it off over all the possible screens and platforms, from your watch to the giant screens of your cities. As an example, the video below (courtesy of NASA/EPIC) displays the eclipse that occured on March 9, 2016. The EPIC camera generated images every 20 minutes for the occasion, Blueturn interpolation techniques enriched them to an ever higher degree of precision. For comparison purposes, below our Blueturn video, you can find the mashup obtained from the NASA images, without any interpolation. 1) Is this really the real Earth? Yes it is a real picture of it. 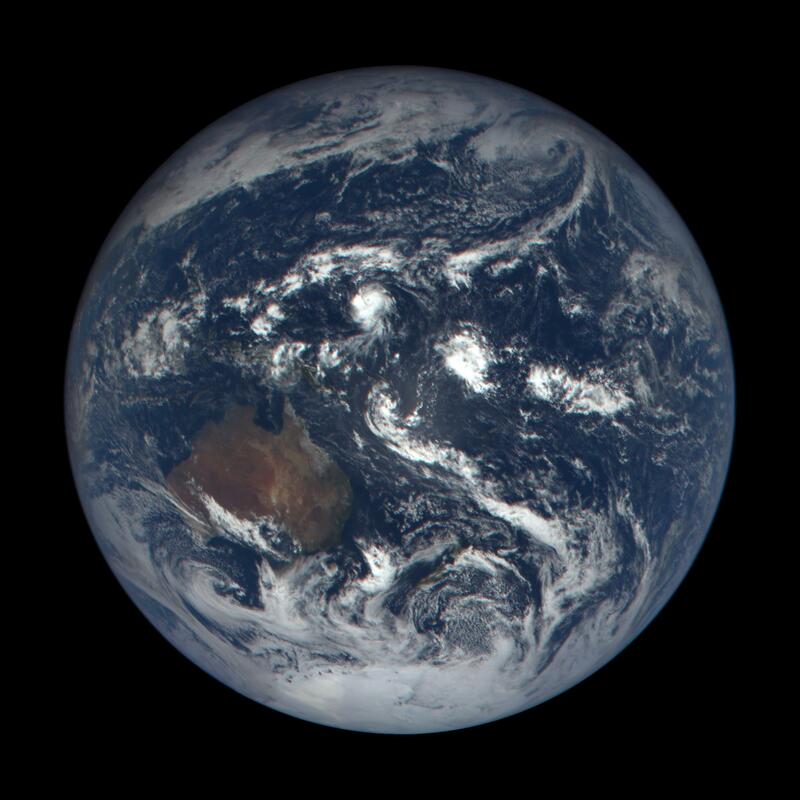 Images are provided by NASA's DSCOVR EPIC camera, in real colors as you would see them from space with your eyes. Blueturn uses these images (around 10-20 a day), and just interpolates between them to create a smooth video experience. We don't add any single synthetic artifact. 2) Why is the Earth rotating? Earth makes a full rotation on itself in 24 hours, and a full revolution around the Sun in 365 days or so. The EPIC camera aboard DSCOVR is at the Lagrangian point L1. Because of its far distance from Earth (1500000 km), this point orbits around the Earth in exactly 365 days, like the Earth around the Sun. That's very slow comparing to 24 hours, therefore from this point you see the almost exact Earth rotation speed. When you move time 24 hours ahead, you turn the Earth by 360 degrees, and vice versa ; that's the principle around the Blueturn app's touch-based user interface, where rotating the Earth or moving time is the same. 3) What is the resolution of the images? The sources images are 2048x2048 pixels, covering a radius of around 8000 km around the center of the Earth, so the Earth with its ~6000 km radius covers 75% of the picture. If you do the gross maths, that's around 20 km per pixel. When zooming too close, since there is not enough information, the image get blurry. Blueturn is not Google Earth, which gives you the highest resolution possible by their provider satellites. Rather it is meant to see the global picture, while adding the dimension of time to observe the atmospheric cloud changes. 4) Why can't I see the night side of the Earth? The EPIC images represent the day side of the Earth because they are taken from the line of the Sun. Blueturn's first mission was to render these images as-is, while solving the continuity issue of only having several images per day. But apart from the necessary interpolation, reproducing a different angle where the night side would be shown works require synthetic elements which we avoid in order to remain in fidelity with the original photography, and stand behind the promise of showing "the real Earth". But let's be honest: we're not exactly aligned with the Earth and the Sun; there is an oscillating path around L1, called the Lissajous orbit, and the angle between DSCOVR, the Earth and the Sun moves within a 10 degrees margin. That explains why we actually do see in EPIC images the beginning of the day/night terminator on one side of the Earth, as a stronger, asymmetric shadow; if the Sun was perfectly aligned to the center the Earth disk would be completely perfect, with a uniform shade around the limbs. 5) Why can't I see the stars? The Earth seen from space is very bright. Very very bright. About 3 times brighter than the Moon. The stars are very dim in comparison. Therefore seeing both the Earth and the stars would require a long exposure for stars, and a short exposure for the Earth. That would be impossible in one shot. It reminds us of the difficulty to see stars around a Full Moon, but that's different: it's the atmospheric halo of the moon light that spreads a taste of the daylight blue around the Moon. From the void of space, Earth has no halo. It's just too magnificent-bright to be mixed with the stars. So forget about all the graphics you see of a crisp shiny Earth surrounded by the Milky Way, in real life it would require some photo processing techniques (like HDR), which the EPIC camera just doesn't enable. 6) Why are the clouds not moving? They are moving, but relatively slowly comparing to the Earth' rotation. A mild stormy day sees local winds of around 100 km/h. With the Earth rotation, it takes a gross average of 12 hours for a geographic location to move from one side of the Earth's disk to the other. So during this time, clouds would move by the size of France. That's not a lot, and it is even harder to observe when combined with the Earth's rotation movement. But you will see it if you pay attention. At another level, if you set the time speed to something quite high, like x1800 or x3600, and if you sit and watch peacefully the Earth turning around, after your brain gets used to the rotation you will start to "feel" the fluidity of the atmosphere layer. That's a mesmerizing viewing experience that has not been ever seen before Blueturn's dawn. Besides that, the Blueturn app proposes a "tethering" mode: by double-tapping on a point of the Earth, the app will both zoom to this point and lock and tether-pan the view to this point at time goes by; this way you cannot miss the beautiful and continuous movement of the clouds. See a video example of this tethering mode (a sand storm over Egypt), or just jump to this deeplink into the application, right into such an interaction mode. Note that by double-tapping again you will go back to global view. 7) What is this wide bright yellow spot in the middle of the Earth? 8) What are those white spots on the timeline? They represent the time stamp of raw images received from NASA. When the time cursor is exactly on such a spot, the image you see is the exact same image as sent by NASA. In-between, it is a calculated interpolation. There are some color codes on these spots: White means that the image was downloaded from the server and loaded into the app, Yellow means it is being downloaded or loaded, and Blue means it is in the storage memory already downloaded from server but still not read and loaded into the app. The images arrive in two stages, low-resolution (512x512) and high-resolution (2048x2048). The bigger the spot the higher the available resolution. 9) Why is the Earth quickly rotating sometimes, while appearing with no clouds? NASA sometimes misses some images. Usually there is a new image every one or 2 hours, and sometimes there can be a gap of 3 hours to several days without any image. The reasons may be a technical problem in the communication with the satellite, or a reconfiguration of the camera. Don't look for conspiration theories. Quoting a NASA scientific official: "Any UFOs (or asteroids, satellites, etc) would need a 20km in size to even appear in one pixel. Considering the ISS is 100m wide and easily seen on Earth, anything large enough to be seen by EPIC would be hard to miss even on Earth." Anyway, when the gap is too big, typically more than 4 hours, Blueturn's interpolation algorithm cannot function well, and we need to "hide" the missing data. Several strategies are possible in that case, like jumping to next available image, or blackening the image. We chose to show a virtual model of the Earth, and accelerate the rotation movement to quickly reach the next available image. So far we haven't found any more acceptable solution. 10) Where is the Moon? It is very rare for the Moon to be visible in these images from NASA. The Moon is above 300000 km from the Earth, the satellite is located more than a million kilometers from the Earth and the Moon, so its field of view to zoom at the Earth is very narrow (0.62 degrees). So the viewing cone looks narrow like a laser beam. So in order for the Moon to be visible, it must be exactly aligned between the Earth and DSCOVR; that would be a very rare conjuncture where 4 bodies would be aligned: Earth, Moon, DSCOVR and Sun. It happens about once a year, and last time was the famous Moon "photobombing" on July 5th, 2016, which received quite a lot of media coverage. To see this rare event inside Blueturn, follow this deep link into the app. 11) Why isn't the Moon visible during the eclipse of March 9th, 2016? This eclipse was one of the most beautiful shots by EPIC. You can see it in the Blueturn app, or just look at the video. Indeed, you would think that if we are on the exact line between the Earth and the Sun, and if we see the shadow of the Moon on the Earth, then the Moon would be found between DSCOVR and the Earth, and therefore within the objective of the EPIC camera. But the thing is that we're not exactly aligned with the Earth and the Sun; there is an oscillating path around L1, called the Lissajous orbit, and the angle between DSCOVR, the Earth and the Sun moves within a 10 degrees margin. So in the case of the 3/9/16 event the Moon is well off-screen, towards the North East actually. This video shows a wider angle with the EPIC image at the center and the Moon at its exact location according to NASA-provided lunar coordinates. 12) Why aren't there more images from NASA? Indeed, the main technical raison d'être of Blueturn is the fact that we're receiving an image from NASA only every one or two hours, and Blueturn's algorithm is here to interpolate and create a smooth video experience. However, the more images the better quality of the interpolations. We saw it during the solar eclipse of March 9th, 2016, and during the Moon photobombing of July 5th, 2016: for these special occasions, NASA managed to send a new image every 20 minutes, which allowed us to create even more amazing videos where the clouds dynamics was exceptionally beautiful and realistic. But they did it only for a few hours, followed by a full day blank with no images. So we see here that the limitation is not the frequency of the shots, but a limitation in the number of images per full day. The reason behind this reality is a technical limitation of the DSCOVR satellite, due to limited budget. There is only one antenna on Earth that is set up to receive the images, and it's located in the state of Virginia in the USA. Since DSCOVR is aligned with the Sun, the antenna can only communicate with the satellite during day time. During night time, the satellite must store it's pictures locally on-board, before batching them to earth at Virginia's dawn. And here comes a second limitation, the storage aboard the satellite is limited. All in all, in order to send pictures at a regular pace, the math boils down to around 12 pictures a day, one every 2 hours or so. Actually that's in winter time, because during summer time, nights are shorter, so less storage is needed, and we can get 20 images a day, one every hour or so. That's why, typically between April and August, we get more images, and therefore better quality results in Blueturn's viewing experience. If DSCOVR had 2 additional antennas, with one in the Southern Hemisphere, dedicated to the project, we could increase the EPIC instrument rate to 19 single channel 2048x2048 images per hour, which is the limit of the onboard S-band transmitter. Decreasing the resolution to 1024x1024 onboard the spacecraft, as DSCOVR does now, would allow even more images per hour. Currently, maximum rate for the spacecraft is 1 set of RGB channels every 15 minutes or 1 set of 10 channels per hour (including the RGB). The extra antenna owners would have to commit to receiving data anytime the satellite was in view, since DSCOVR also provides the Earth with solar storm warning data (its primary mission) on a continuous basis. Currently, this channel uses a series of NOAA low data rate antennas distributed around the world. These antennas cannot handle the EPIC images. As with the original mission, then named Triana, the extra high rate antennas must be able to receive both the high data rate EPIC images and low data rate solar data to provide continuous coverage. At present, the satellite switches from high data rate to low data rate when Wallops Island is not in view. It cannot do both simultaneously. Three antennas (one in Australia) was the original plan when the mission was a pure NASA mission called Triana in the year 2000. That closes dramatically the last option to receive data during Virginia's night time: it's not about technical limitation, but about a choice of mission purpose. Since Triana, the Earth view purpose that was dreamt by Al Gore went through a very accidented path, specially because of doubts by governing parties about the relevancy of this purpose. In the end the mission made it to space and the dream came true, but only half of it. Blueturn is the good news that completed the missing half.